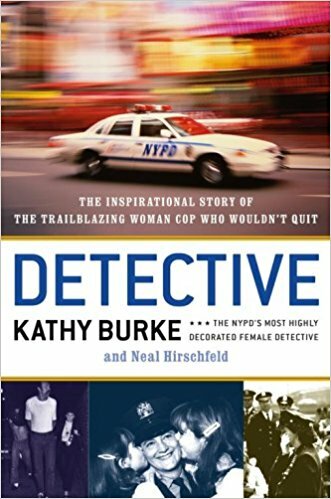 First published in 1979, this book begins with a caution that New York locations are often expendable. New Yorkers are accustomed to losing their favorite restaurant overnight, yet the Dakota has outlasted all other residences, and businesses (with the exception maybe of Fraunce’s Tavern.) 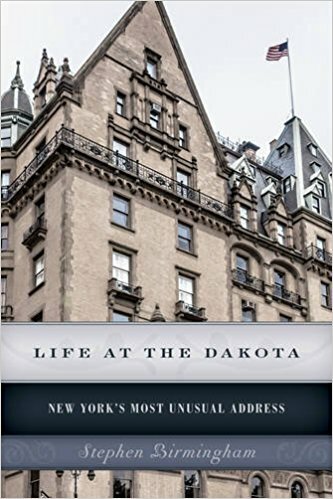 Built by Morris Hunt in the 1880’s, at a time when the patricians built their mansions along 5th Avenue, the Dakota was an apartment house in the guise of a mansion. The management took care of housekeeping for the common areas, and it was fireproofed with stone-block partitions (though in my experience as a construction worker, the stone may actually have been plaster.) The building lasted through changes in styles, from Gilded Age, to Beaux-Arts, Modern, and changes in the neighborhood. In the 1930’s, William H. Pratt moved in, to the chagrin of many. It wasn’t the fact that he was an Englishman that bothered the residents, nor that he had upper-class English airs. The reason behind the neighbors’ disgust was that Mr. Pratt was an actor. There was no way those old-money snobs would accept a parvenu like William Pratt, who went by the stage name Boris Karloff! Actors had always been seen as low-class, whether they had the money to live in the Dakota or not. Then came John Lennon, the rabble-rousing, attention-seeking, publicly-weird Englishman whose US residency was precarious. Nobody wanted him or Yoko Ono in their building, but they kept to themselves, never making a sound or having any visitors. Frederick Weinstein, the documentary filmmaker, moved in too, and found that plaster dust from a lower-floor renovation was coming up his fireplace. It’s interesting to read about the dynamic changes to the area and the residents, but after a while it loses relevance. The Dakota is popular with wealthy intellectuals and performing artists, yet it’s still just a place for the wealthy. Nobody lives there unless they have a lot of money, which most New Yorkers do not. I suspect that may be the reason it was out of print for so long. Amir Said starts with basic info about the five boroughs; how Manhattan is an island with a grid, how Robert Moses plowed through the Bronx, how Staten Island is a mob residence, how Brooklyn is getting more love than ever before, etc. 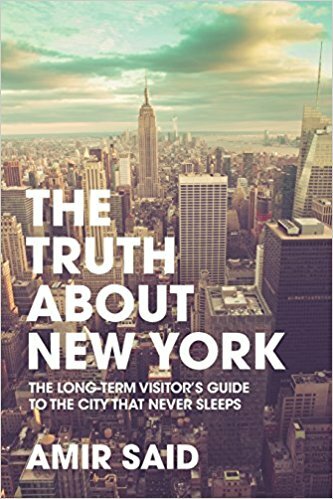 Some things in here I don’t believe, like the part about NYC being the place for jobs. Illegal immigrants take a lot of the jobs in restaurants and construction, and most of the tech jobs are done by unpaid interns. Obesity is not a major problem here, because everyone has to be on their feet. He does give some humorous pages to renting an apartment in the city, with all the down-and-dirty about rent control and how the landlords try to scare away tenants. He advises the renter to discard the dream of a spacious apartment, and avoid any place with a commute of more than 45 minutes into Manhattan. Stay close to a good public library (decent people in the area) and avoid police stations (they’re placed in high-crime areas.) The subways are how people get around, but they are unreliable, filthy, overcrowded, and prone to delays. The book goes on to cover dating, food and dining, nightlife, culture, education, and religion. Sometimes the writing goes too far, some parts are too long, each chapter could be its own book. Some parts, like the one on schools, would be better if they included interviews with parents, maybe have a part about schools where the White kids are a minority. In a 2010 article, Dr. Haynes recalls finding the portrait of a long-dead ancestor in his parents’ attic. He was a respected Black leader, and the portrait was part of a series for the White House, somehow lost from the others and consigned to storage. Why was the portrait forgotten, he wondered, and why did his parents leave it in the attic for so long? 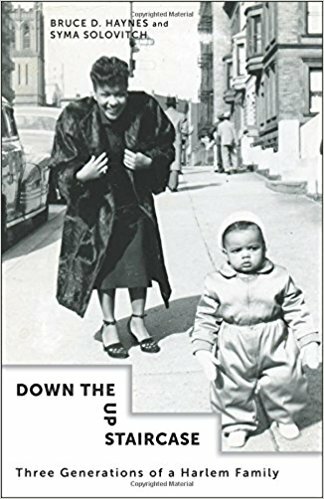 Throughout the book, the author studies the same issue regarding his parents; why did this respectable family fall into reclusiveness, and why did they stay in Harlem? Bruce Haynes (born 1960) comes from an unusual social class, the Black Harlem gentry. He, his parents, and his two older brothers lived in a stately Harlem townhouse, which alternated from being subdivided into apartments to returning to its one-family state. Though his parents considered themselves the cream-of-the-crop, they let their home fall into ruin. He describes the house, with beautiful woodwork and period décor, as being a dump that rivals the Collier Brothers. Garbage piles up, they never throw anything away, the roof leaks, and eventually his parents physically separate while living under the same roof. From childhood to age 18, he doesn’t seem to have enjoyed being home. Neither do his two brothers. In some ways it’s a story about people who straddle two worlds. Haynes mother was a social worker with an office in the World Trade Center, fashionably dressed, held court at downtown restaurants, but she didn’t have these friends over to her home. It’s not clear if it’s because their house was in a state, or if they let the house become a hovel because they couldn’t have visitors. Harlem, by the time Haynes was ten years old, had become unsafe, and he says that when he was growing up no white kid could walk in those streets. His older brothers, born 1950 and 1953, also suffered from street crime. I doubt that any White person visited their Black friends in Harlem by the late 1960’s. Haynes’ pretty much loses his brother over the years. One of them gets killed at work, and the police make little effort to find the killer. His oldest brother joins the Nation of Islam, suffers when they break up after Elijah Muhammed’s death, and then come the drugs and the mental breakdowns. The saddest thing is that Haynes learns about his brother’s murder while sleeping over at a friend’s house, and says he’d rather stay there than head home. He clearly felt more comfortable with the White kids at the private schools he attended than in his own home and neighborhood. This book paints a really weird portrait of the Harlem that the author knew as a boy. There is a funny part to this story, in the way that gay men were accepted there. He recounts a transvestite who ran a newsstand, and the hair salons were run by men with effeminate mannerisms. He theorizes that with so few decent men in the community, nobody cared if a guy was a sissy, so long as he pulled his weight. In the 1980’s these men started dying off thanks to a little-understood disease. I wonder if Down the Up Staircase is a study on downward mobility? This was a family with well-educated parents, refined and elegant, whose world always seems to crumble around them. The author says that his father, a parole officer, could have done a lot more with his career, and hints that the man was a bit of an underachiever. His oldest brother slides down into an abyss of drugs and the wrong crowd, further and further away from his parents’ values, never climbing back up. Then his next oldest brother graduates high school, marries his teacher (?!?) and goes to work in a bicycle store, where he gets killed. By the mid 1990’s, the elegant townhouse is in a terrible state of repair, and it’s a wonder it didn’t get condemned. Thankfully, he took his teachers’ advice, to find a rural college that would give him a full scholarship, and leave the city. The house was sold in the 1990’s, and at this time it’s probably occupied by a White family and would sell for a million dollars. The old Harlem elite is gone, and Dr. Haynes admits that there’s no way he could afford to live in Harlem today.